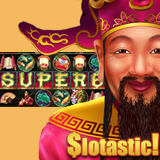 Slotastic, an online casino dedicated to slots players all over the world, is one of the first to offer the unique new Super 6 six-reel slot game. Super 6 is an Asian-themed game from Real Time Gaming that has six reels of glittering symbols depicting the cultural riches of China. Grouped Wilds double any prize they appear in. Scatters trigger free spins. If the triggering scatters are all on the same row then there are more Wilds during the free spins and bigger bonuses like Mega Grouped Wilds and 5X prize multipliers can be won. Scatters trigger free spins in new six reel Chinese-themed slot from Realtime Gaming. Today and tomorrow only, Slotastic is giving 10 free spins to try the new game. Until the end of the month, they'll double deposits (up to $333) and throw in 50 free spins. Super 6 is now available in Slotastic’s download casino and instant play online casino and, like all of its most popular games, it’s also available in its mobile casino for iPhones, iPads and Android smartphones and tablets.